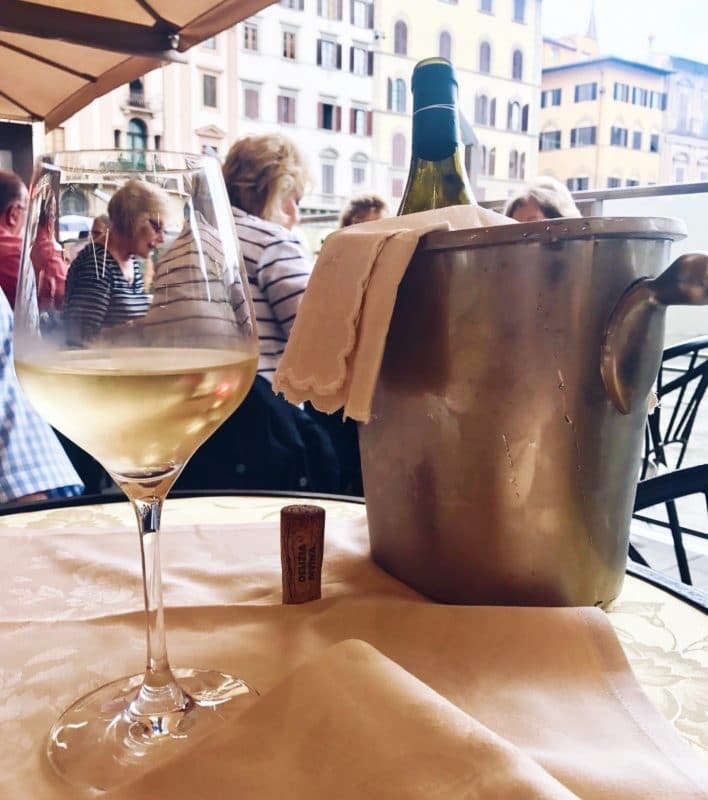 Italy is known for some of the finest things in life, incredible food, even better wine, fabulous fashion and a lifestyle that encompasses all of the above. 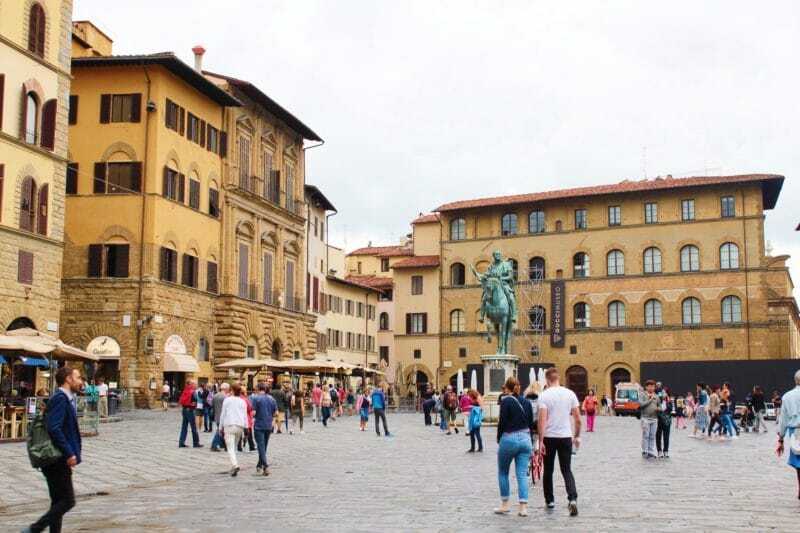 You will absolutely find all of these things in Florence, and if you’re looking to splash out and enjoy a bit of luxury on a visit there then there’s plenty of places for you to do so. 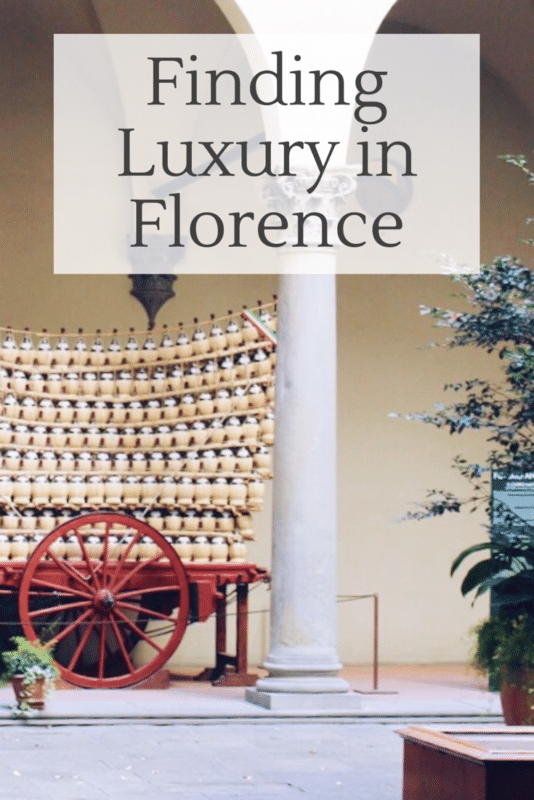 Finding luxury in Florence may not be as easy as somewhere like Paris, it’s definitely got a historic feel to it’s character, which only adds to it’s charm, but there are plenty of places you can indulge, you just have to find them. 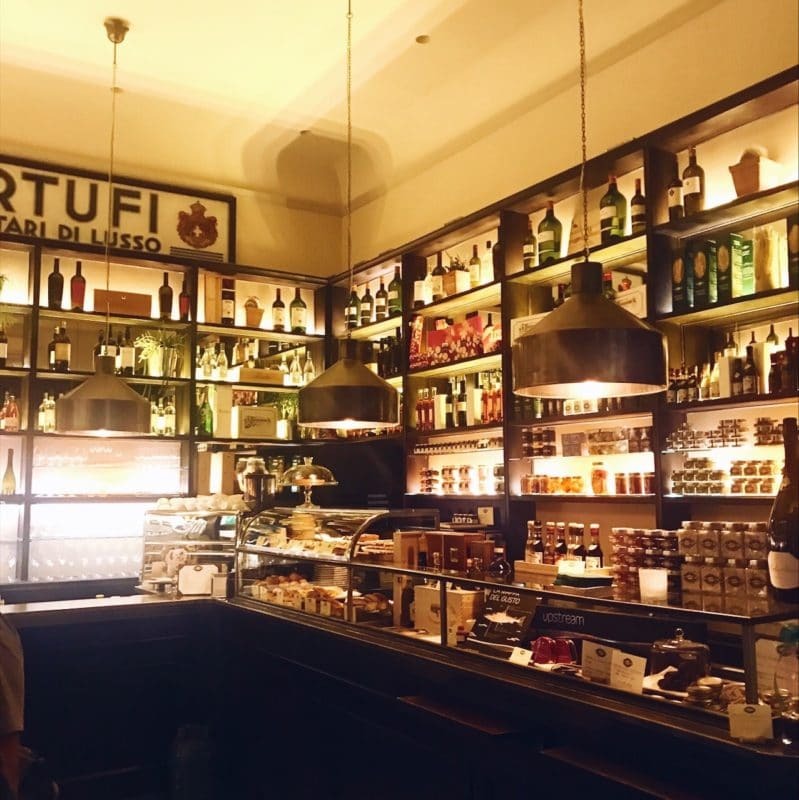 Located on Via de’ Tornabuoni in the historic centre of Florence, Procacci Firenze is a beautiful little wine bar and delicatessen. Right opposite our hotel it was perfect for a glass of wine, or as we preferred a bottle of prosecco before dinner. Dating back to the 1800s, Procacci is a firm favourite of the locals, noted for its vast range of wine and truffle paninis. The royal family at the time made Procacci an official supplier to the palace, and subsequently they opened further bars in Vienna and Milan taking the Tuscan atmosphere and traditional dishes to other corners of Italy. 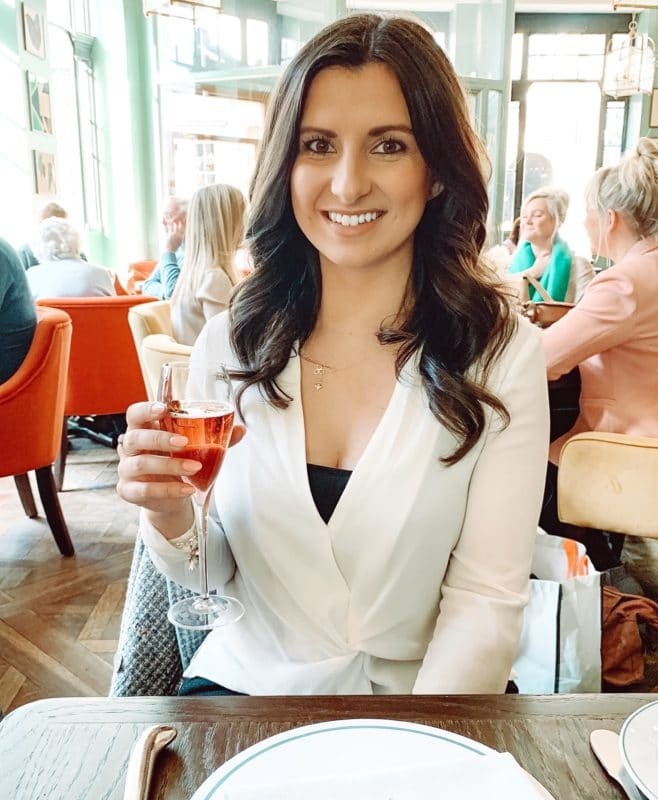 Procacci Firenze is the original, and the relaxed but sophisticated atmosphere was amazing to enjoy each evening sat at the little high tables. They also have a gourmet shop selling olive oils, truffle sauces and butters. As I mentioned before this street is in the historic centre of Florence. It’s traffic free policy means you can enjoy an uninterrupted stroll down if, and trust me it will take a while. 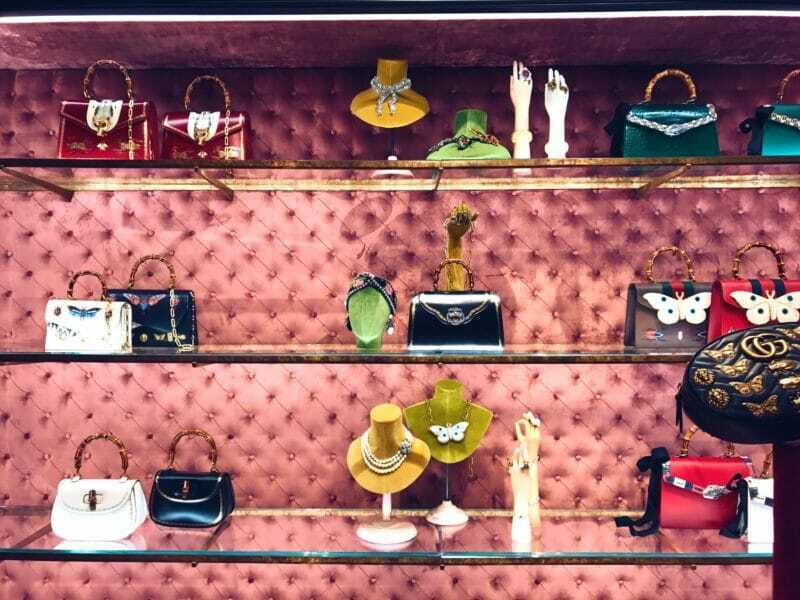 The street is lined with every luxury designer you can imagine, with each window stopping you in your tracks to gaze at the seasonal trends, ridiculously priced jewellery, and the finest leather handbags. Think Hermes, Fendi, Chloe, Tiffany & Co, they’re all there so for a luxury shopping day, this is your street. Located on Via de’ Tornabuoni is the flagship Gucci store, and it is noticeably different to any other Gucci I’ve ever been in. 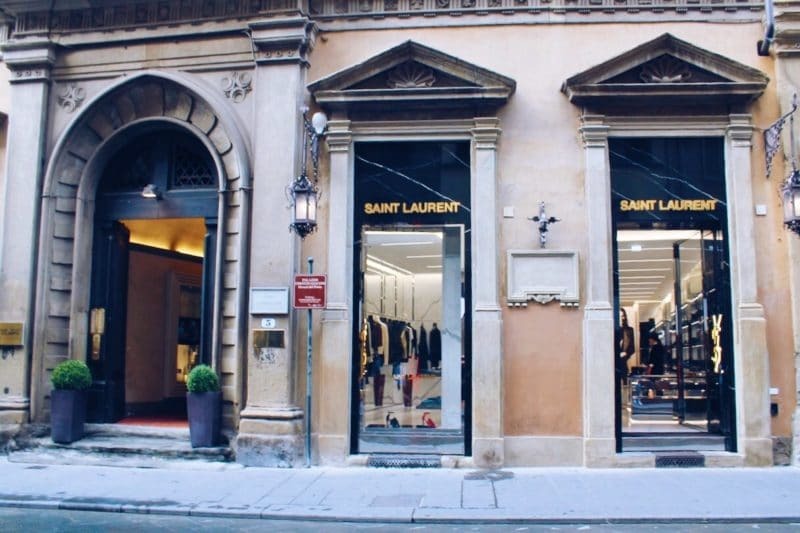 Rather than the usual gold mirrored walls, white marble floors and plush brown fabrics, Gucci Firenze is full of colour and character. It’s bright pink, even the walls are pink velvet, and in such an old spot it’s made up of lots of tiny little rooms all linked together. The staff are incredible and can’t do enough to help you, without being intrusive or pushy. 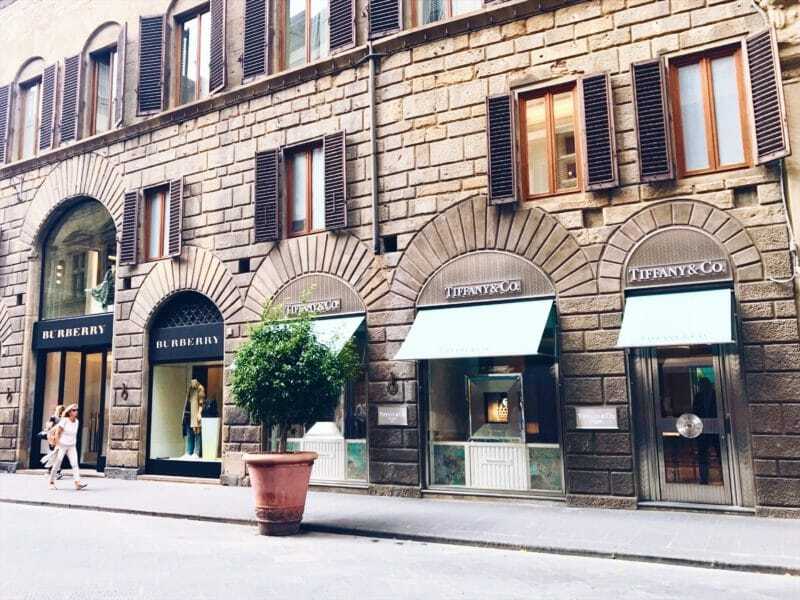 If the flagship store isn’t enough of a Gucci experience for you, head to the Gucci Museo on Piazza della Signoria, where the Gucci story began. 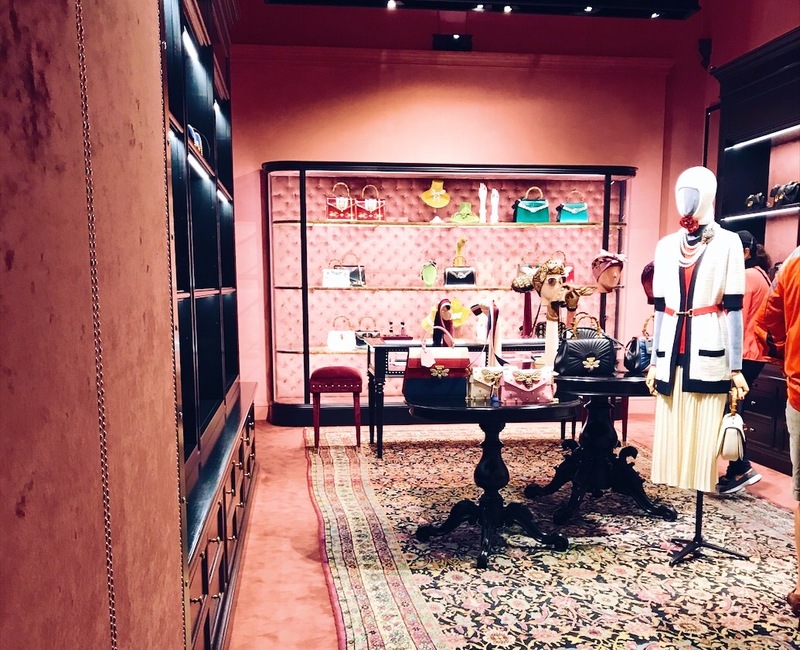 The old warehouse has three floors of Gucci history to enjoy. It’s currently closed for refurbishment but will be opening again in future with a new calendar of exhibitions. 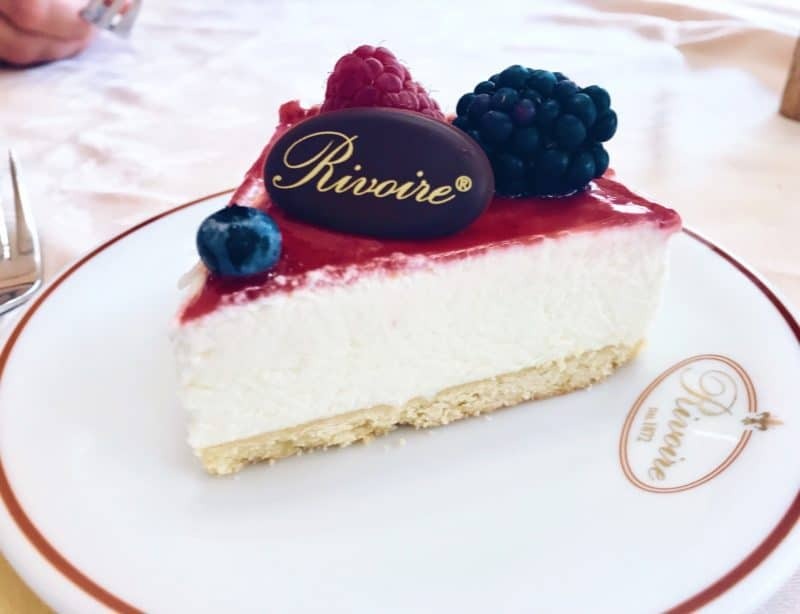 On the opposite side of Piazza della Signoria is the beautiful Rivoire cafe, a beautiful Betty’s/Angelica’s type of place serving lunch, sweet treats and lots of wine. From a spot on their sheltered and heated outdoor terrace you can indulge in a long lunch, or even just a chocolatey cheesecake treat with Italy’s finest coffee. Some of the cities ancient artwork stands to one side, and the Neptune fountain is ahead of you. What a view to enjoy while you sip on a glass of wine and sample an olive or two. Recommended to us by our hotel this was a much more formal dinner option, and while it didn’t look like much from the outside the food and service was exquisite. 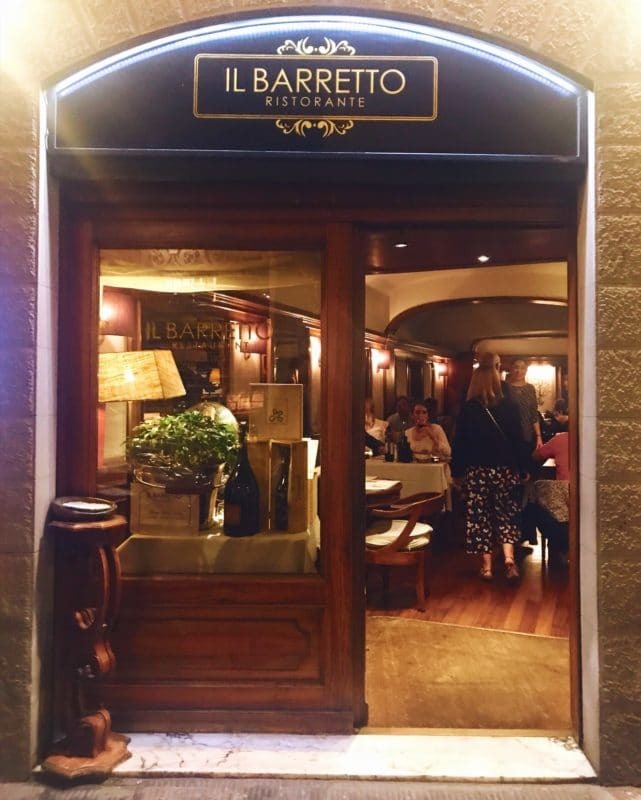 The original Harry’s bar, Il Barretto is a far cry from the Harry’s bar you might know from Newcastle or elsewhere in the world. It’s discreet, private, and attentive to parties of all sizes and occasions. Perfect for a very civilised family meal, business dinner or date night. I had steak and it was amazing. 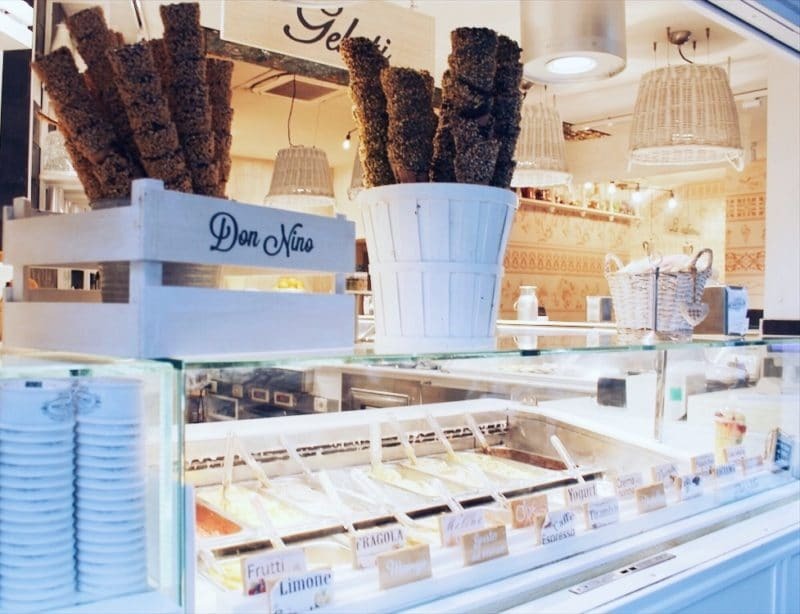 While little geletaria’s pop up all over Florence, my favourite was more the full scale ice cream and confectionary parlour that is Don Nino. 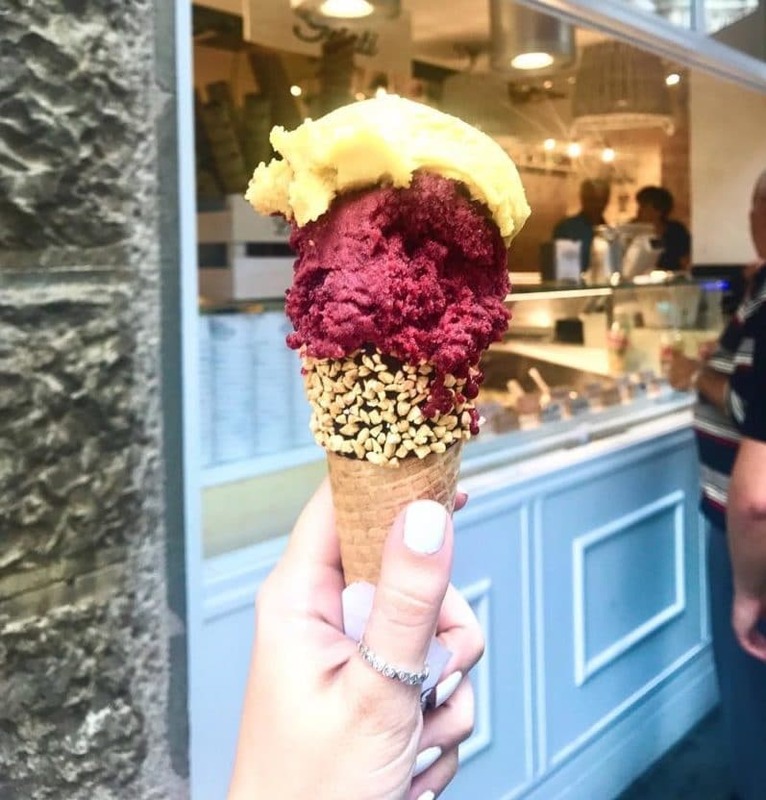 Right on Piazza del Duomo, a seat on one of the tiny white tables outside gives a view of the Duomo itself while you indulge on the best ice cream you could imagine. 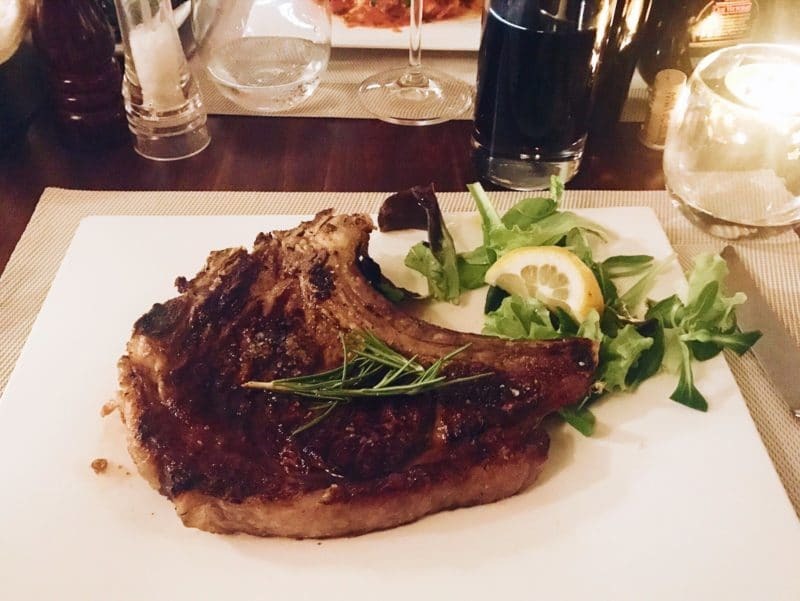 Don Nino have a full menu, with all natural ingredients and made from traditional old recipes fine tuned to give your taste buds a serious treat. They pride themselves on their craft and quality, and the parlour itself is like a throwback in time. 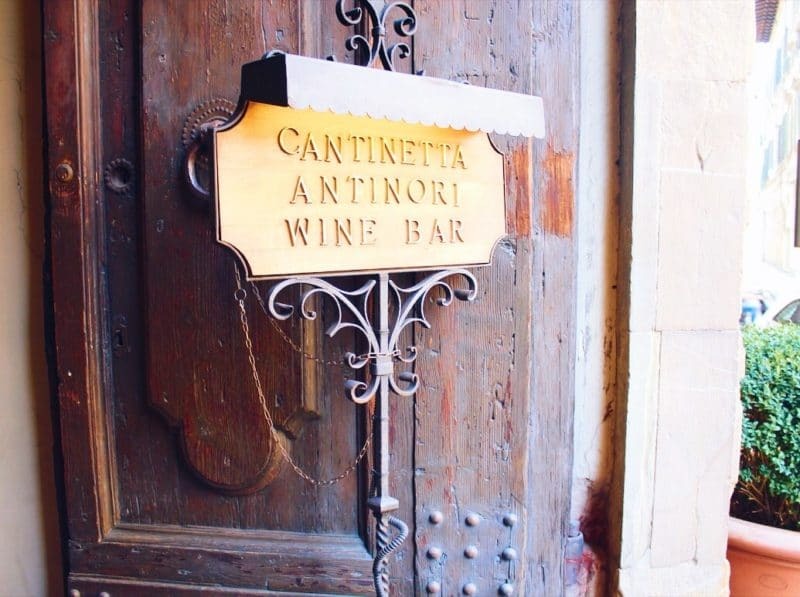 Steeped in history the Cantinetta Antinori wine bar and restaurant is located on the ground floor of one of the oldest buildings in Florence. 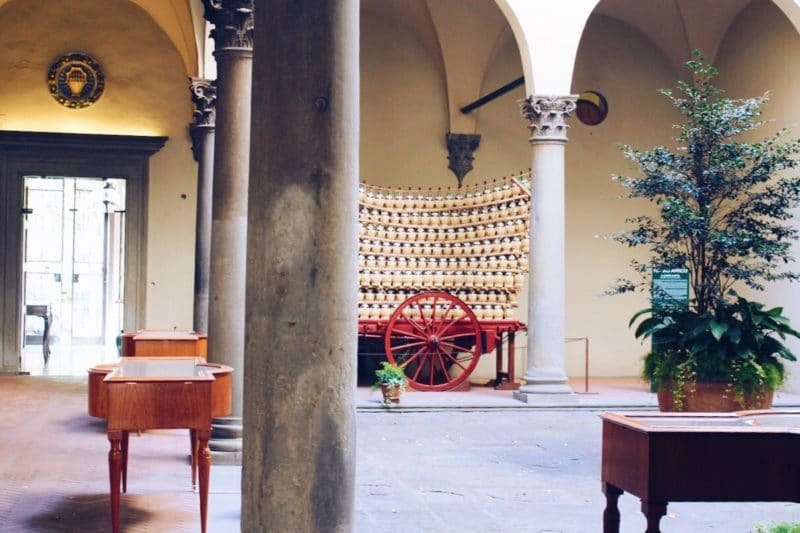 Traditional Florentine architecture welcomes you in through the giant old wooden doors, to what was the Antinori family mansion for over 600 years. 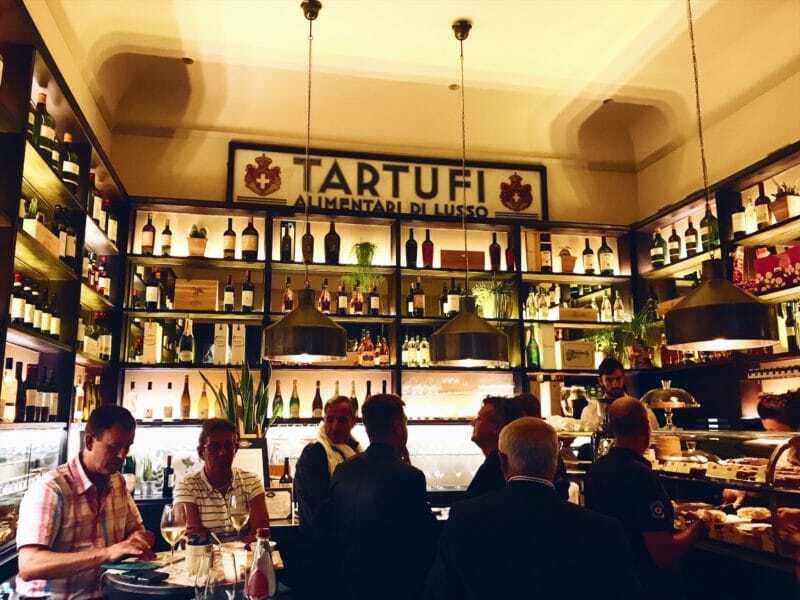 The restaurant and wine bar offer traditional Tuscan cuisine, and here you can still try all of the Antinori wines. A must visit for wine lovers.